This article is about the ski area in Utah. For Mont Alta, the ski area in Quebec, see List of former ski areas of Quebec. Alta is a ski area in the western United States, located in the town of Alta in the Wasatch Mountains of Utah, in Salt Lake County. With a skiable area of 2,614 acres (10.58 km2), Alta's base elevation is 8,530 ft (2,600 m) and rises to 11,068 ft (3,374 m) for a vertical gain of 2,538 ft (774 m). One of the oldest ski resorts in the country, it opened its first lift in early 1939. Alta is known for being very high altitude and receives more snow than most Utah resorts, its average annual snowfall is 545 inches (13.8 m). Alta is one of three remaining ski resorts in the U.S. that prohibits snowboarders, along with nearby competitor Deer Valley and Vermont's Mad River Glen. Alta is one of the oldest ski areas in the U.S. and is one of just three ski areas in the U.S. that limit access to skiers only. 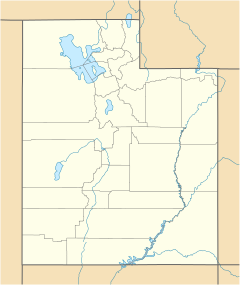 Located at the head of Little Cottonwood Canyon barely 30 miles (48 km) from the Great Salt Lake, Alta resides in a unique micro climate characterized by over 545 inches (1,380 cm) of high volume, low moisture snowfall annually. The Alta ski area features long, straight, fall-line pitches. Among the most well known and most favored are Alf's High Rustler, Eddies High Nowhere, Stone Crusher and the Baldy Chutes. Though widely respected as one of the most challenging of in-bounds ski areas in the world, Alta has always viewed itself as a local's and family oriented ski area with over half of its terrain devoted to intermediate and beginner skiers. The community of Alta was established in 1871 as an offshoot of the silver mining operations in Little Cottonwood Canyon. A fire destroyed most of the town in 1878, then a cataclysmic avalanche in 1885—combined with the decline of mining—heralded a period of dormancy for the town. The area experienced a modest resurgence in mining in the 1900s, but the town declined again shortly thereafter, and was deserted with the exception of a few hardy miners who continued to intermittently prospect the area. In 1935 the U.S. Forest Service retained the noted skier Alf Engen to hike into the area and determine its potential as a future ski area. Engen's reports expressed great promise for the area, and recommended the purchase of additional surrounding lands to form the ski area. In 1937 a prominent Salt Lake City lawyer, Joe Quinney, along with other local businessmen, formed the Utah Winter Sports Association to oversee the development of skiing at Alta. In the following year construction began on the original Collins chairlift, fashioned from a surplus mining ore tramway system that featured a clamp-cam bullwheel gripping a metal cable strung with single-seat chairs. Slow but dependable, it was just the third such lift in the United States, after Sun Valley and the Magic Mile at Timberline Lodge on Mount Hood. Alta opened to skiers for the first time in 1939 on January 15, offering a single ride on the chair for 25 cents. Alta installed its first triple in 1991, by upgrading the Germania double chair. The resort began adding a developed snowmaking infrastructure in 1996, and the ski area continues to develop and refine the process. The late 1990s and early 2000s were marked with further modernization. In 1999 the Sunnyside lift was replaced with a detachable triple chair, the resort's first detachable chairlift. Two years later the Supreme chair was upgraded to a triple, and the Sugarloaf chair was replaced with a detachable quad. During the 2007–08 season, Alta introduced a new Axess RFID electronic lift ticket system, similar to that of the Solitude Ski Resort. During the 2008–09 season, Alta added a conveyor system at the start point of the Supreme lift that assists skiers in getting on the fixed-triple lift and allows the lift to operate at a faster speed by speeding the loading process. Alta added safety bars to the Sunnyside lift in 2010 and to the Collins, Sugarloaf, and Supreme chairs in the summer of 2011. The most recent lift development was the new Supreme lift in the 2017–18 season, replacing the former Supreme lift and Cecret lift, going from the Sugarloaf base area to the top of Supreme, where the former chair had ended. The ski area is in the process of planning for the next several years. Many of the decisions will be made as the Mountain Accord process evolves. This involves a tram to the top of Mt. Baldy, a lift from the Sugar Bowl to Sugarloaf Pass, and improvements to parking. The resort currently has three detachable quad chairs, one detachable triple chair, two double chairs, and three surface tows. The terrain is classified as 25% Beginner, 40% Intermediate, and 35% Advanced. On January 15, 2014, a group called Wasatch Equality and four individual snowboarders filed a lawsuit in the United States District Court for the District of Utah against Alta Ski Area and the United States Forest Service, seeking to permanently disallow Alta from enforcing its anti-snowboarder policy and snowboarding ban. Alta Ski Area prevailed in the ruling and continues to exclusively serve skiers. ^ "Mountain Stats". Alta.com. Retrieved January 4, 2018. ^ a b Grass, Ray (March 9, 1999). "Alta at 60". Deseret News. p. D1. ^ a b "Alta: Resorts: Ski Utah: The Greatest Snow on Earth". www.skiutah.com. Archived from the original on 7 February 2009. Retrieved 2009-01-26. ^ Del Sole, Christopher. "Resorts That Ban Snowboarding". snowboarding.about.com. Retrieved 2009-02-08. ^ Hamilton, Linda (January 19, 1989). "Secret ingredient, storm patterns make Alta special". Deseret News. p. D1. ^ Grass, Ray (January 19, 1989). "Alta". Deseret News. (at 50). p. D1. ^ ZRankings, Top Ski Resorts. "ZRankings Topographical Survey, Ski Terrain at Alta". ZRankings. ZRankings. Retrieved 27 October 2015. Wikimedia Commons has media related to Alta Ski Area. Alta Skiing Guide Book – The Powder Hound's Guide to Skiing Alta, a 160-page guide book that describes each of the important runs on one of the most challenging mountains in alpine skiing.